“The best things are a wonderful sense of community and belonging, looking after my neighbours and feeling looked after. Financial freedom, change of scene, great friends and canal family, lots of colourful characters and musical gatherings.” She still lives aboard now. But surely children make life aboard so much more difficult? The nurse said, “ I enjoyed living on the boat even more when my daughter was born, because I spent a lot more time at home with her and enjoyed walking along the towpath whilst pushing her in her buggy. I knew a good few boat mums and felt quite connected. We travelled on the boat a lot as well before she started school, so it was a great adventure. We do so much off the boat, she is well loved on the canal. My daughter does like going up to Denham and being at the country park”. The Marine Engineer and his wife lived aboard for four years before their first son arrived and lived aboard as parents for 8 1/2 years in total. “Once we had children I think my feelings pretty much stayed the same. to be honest we had a better social life on the Cut with kids than we ever would have had in a house. You can be outside with friends and the kids inside asleep or outside playing with you, and when we moored outside or near a pub a really good quality baby monitor meant we could sit in the pub have a few drinks and the boys would be asleep inside a locked boat and very safe. The advantages for kids are the outside lifestyle, growing up knowing and understanding a non orthodox way of life, great education of life and nature. Healthy living - having to walk to many places sometimes a long way to get to the shops or even just the car. We lived in some of the most beautiful places in England. Oh yeah, and did I mention getting to have the pub garden (swings, slides and the rest) as your own little garden when you were moored up outside? 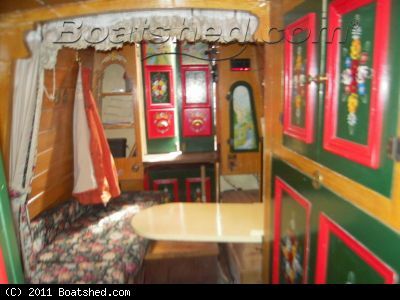 What are the most common questions that people ask you about living on a boat? I asked, what are the best things for children living aboard? “As a parent the greatest thing for me was teaching and watching my boys learn how to swing a lock gate and lift and lower paddles properly etcetera, at an age where most other kids would not have a clue what they were even for. “I do miss it terribly but would not go back for the reasons I’ve already mentioned. What do I miss? the shock on people’s faces when you say you live on a boat. The friends, the pubs and social life; talking to complete strangers on the towpath and not being treated or treating anyone like a psycho murderer, the peace and quiet, no traffic, crowds, noisy neighbours and of course the beautiful English countryside like nowhere else on earth. “What I am trying to say is that of all the chapters in my life, the canal would be the longest, and holds truly some of the greatest, loveliest memories I could ever wish for, it also holds the most painful as well, so for us it was a good time to go. Never look back, just forwards, but always remember what has passed, it makes you a better person at the end of the day and appreciate what you had and what you now have. These accounts of parenting on board made me realise that perhaps I could have everything I wanted if we just travelled in The Countryside instead of in and around London. I thought that to have a sense of community we would have to settle down on a mooring. The Doctor always said that if you stay still on a mooring you might as well have a house; that there would be all the disadvantages of a boat without the advantages. But the boaters I’d interviewed from outside of London had inspired in me visions of myself in colourful clothes, huddled around a campfire, surrounded by beautiful countryside and like-minded romantic day-dreamers. 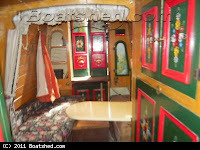 I dreamed of living close to nature, the freedom of the Cut and the gaily painted charm of a traditional boatman’s cabin. I told The Doctor that maybe I didn’t have to have a house, or a mooring. But I did want a bigger boat, with our own bedroom and a washing machine. He was so relieved. 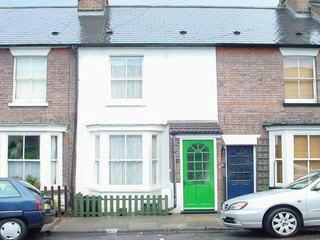 He never wanted to stop travelling, but he had been willing to give up the lifestyle that he loved, spend a vast slice of his salary on rent, council tax and bills, and see less of the children due to time spent commuting, all so that we could live in a Victorian cottage in St Albans. A cottage in St Albans where the landlord did not want tenants with children. I'm a little embarrassed to admit I've become quite intrigued with your narrowboat lifestyle and have been researching narrowboat holidays. It may be years before it happens, but I hope it does happen. It sounds fantastic and I really enjoyed reading this post. Thanks sunset. It would be a lovely holiday! Life onboard sounds so romantic and rosy. I'm especially sold on the idea of having a pub as your front room. 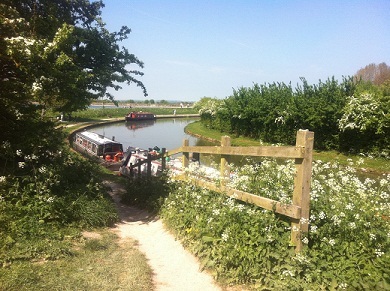 I live right next to the Kennet and Avon Canal (the Rowbarge pub is my local) and so see lots of boaters every day. You've given me a glimpse into their life and now I know why they're always smiling and look so happy! i really enjoyed it Great!!!!! !